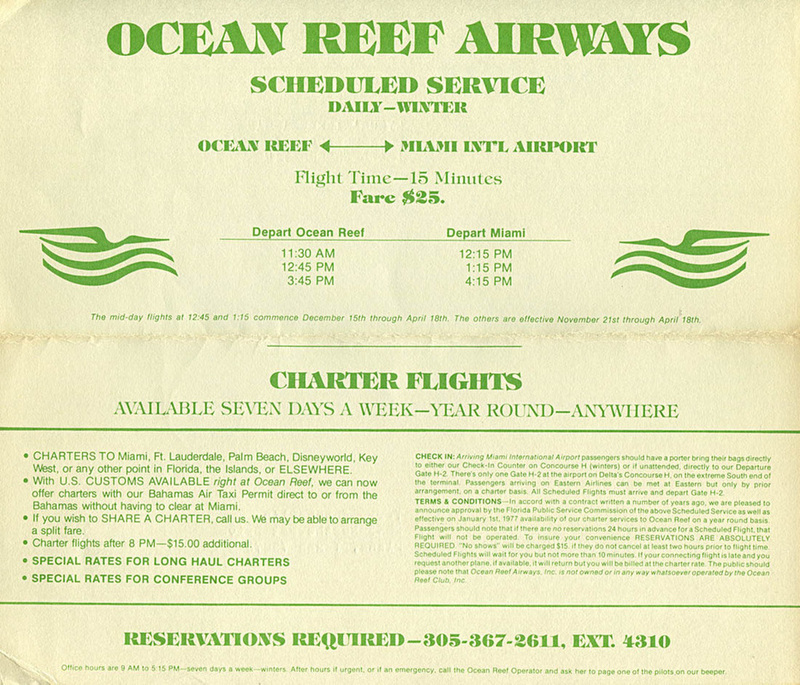 Ocean Reef Airways was the southern division of Montauk Caribbean Airlines of New York. The airline operated flights from Miami to an airstrip at the exclusive Ocean Reef Club in Key Largo during the winter season. Passengers had to be members or guests of the club as the general public was not allowed access to the airstrip at the northern tip of Key Largo. The airline also offered charter flights to Walt Disney World, Key West, Palm Beach, and other points in the Bahamas, Caribbean, and Florida using Piper Navajos, a de Havilland Twin Otter, and Beech Baron twin props. Below: Timetable showing scheduled service for Winter 1977 - 1978. Ocean Reef Airways route map showing the single 32-mile route between Miami and the Ocean Reef Club Airport (07FA). Created with Great Circle Mapper. Ocean Reef's sole DHC-6 Twin Otter, N920R, pictured at Miami in the green, yellow, and white livery of Montauk Caribbean. This aircraft was also leased to Air Florida in 1979 and flown between Miami and Marathon. After twelve years of winter operations, Ocean Reef Airways was taken over by Provincetown-Boston Airline on November 1, 1982 as a way to increase their arrival slots at Miami airport during the air traffic controller strike. PBA continued the service to Ocean Reef, with as many as seven daily round-trips, until 1985, using Cessna 402s.